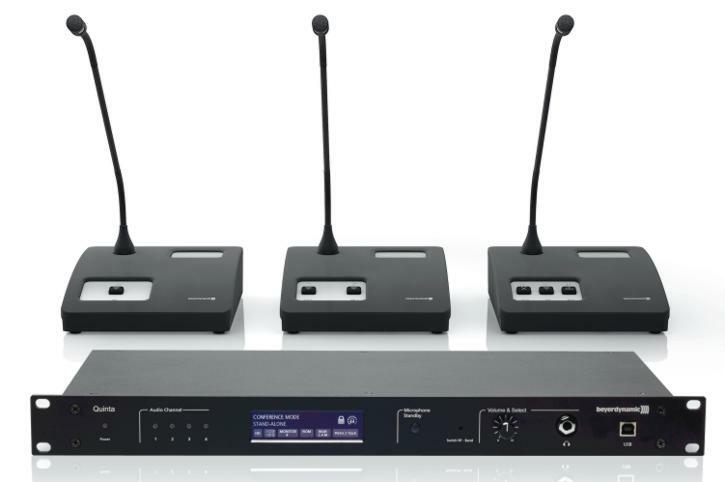 At Prolight + Sound Show 2012, Frankfurt, beyerdynamic introduced its 5th generation of wireless conference systems, Quinta, employing the wide experience the company has gained in the field of wireless conference systems. The control unit of the Quinta system is designed to provide operational safety, reliability and transmission security. Three frequency bands (2.4 / 5.2 / 5.8 GHz) are used for reliable wireless communication. Changing channel works silently during operation and is done either automatically or manually. The system meets the latest regulations of the European Telecommunications Standards Institute (ETSI) and can be integrated into existing or newly set up computer networks that comply with the IEEE 802.1 IT standard (AVB). A Quinta system can be easily controlled wirelessly using a smartphone or a tablet computer. For the chairman's, delegate's and double delegate's microphone units there is a choice of gooseneck microphones with XLR connector in four different lengths. The solid housing, the most robust and scratch-resistant paint from the automotive industry combined with brushed stainless steel give the microphone units a high-quality look. Further features include back-lit keys for dark environments, inscription in braille or the programmable function button for the chairman play a decisive role. The Quinta microphone units have already been awarded the Red Dot Design Award for exceptional detailed solutions.